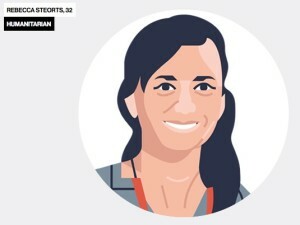 We’ve known for years that Beka Steorts is on the cutting-edge of statistical science, and now The MIT Technology Review has realized the same. Last week she was named one of 35 Innovators Under 35, in the category of humanitarian. We first became familiar with Beka’s work in 2013 when she was a visiting professor at Carnegie Mellon and was introduced to us by Prof. Steve Fienberg. Since then, we’ve felt very fortunate to collaborate with her on projects such as the UN enumeration of casualties in the Syrian conflict, and we look forward to many more years of work with her. She is one of several young stars we include in our superheroine hall of fame, which includes Anita Gohdes, Amelia Hoover Green, Jule Krüger, Kristian Lum, Shira Mitchell, and our director of research Megan Price. In 2013, Steorts realized that by combining a Bayesian statistical approach with a machine-learning technique called blocking, she could reliably merge the databases—and do it in less than a day. Blocking works by placing items that are similar to one another—say, similar names or approximate dates of death—in the same group for comparison. (A simple analogy: if you were trying to compile one whole set of cards out of two incomplete decks, you’d separate them into suits first and then discard the duplicates.) Only after it has assembled the various blocks does Steorts’s software do the intensive work of linking individual records. Here’s a video of Beka delivering a talk at EmTech 2015. CC BY-NC-SA, excluding image and excerpt.